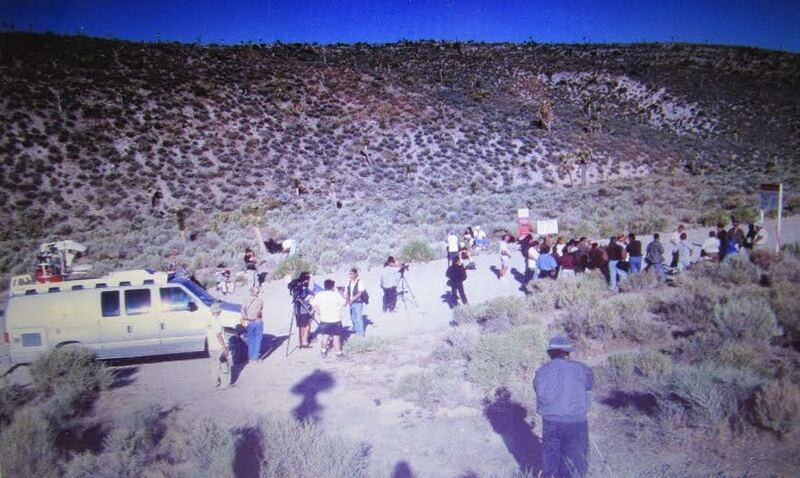 RACHEL, NEVADA — For the 150 people gathered at sunrise Saturday near one of the most talked about classified military facilities in the world, “Area 51” is home not to alien UFOs but to a good old American conspiracy. 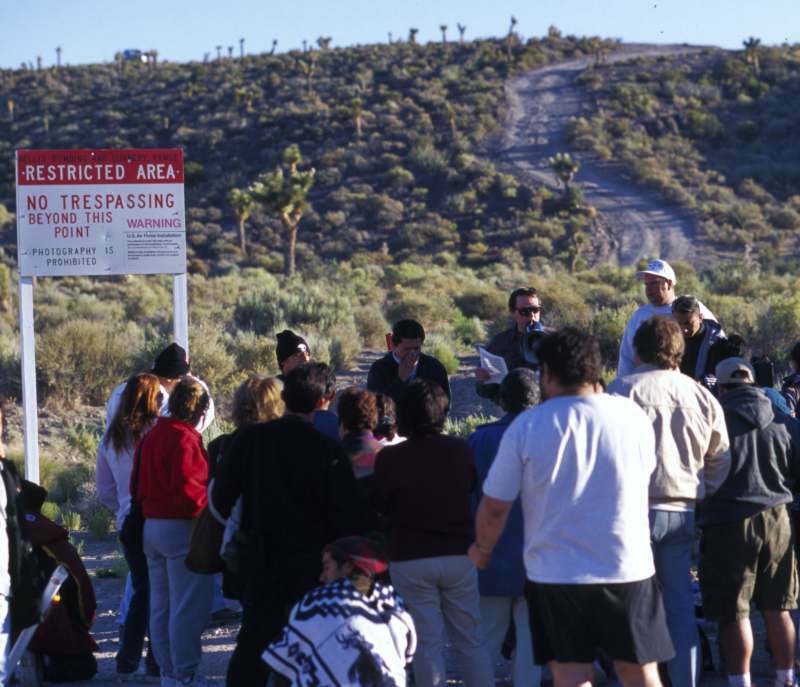 The alien-UFO story, most of them now say, is government-concocted propaganda designed to throw people off the real story behind Groom Lake, as the military prefers to call Area 51. If they doubted themselves before they got to this roadstop 150 miles north of Las Vegas, they likely left more-convinced as the nearby rally fell under the steady gaze of federal park rangers, security guards on distant hills and unmanned cameras and microphones behind unmarked boundaries. Assembled at 6 a.m. on the sixth day on the sixth month — symbolic admission to the devil’s work many said is being done here — they came from as far away as New York, Illinois and Oregon for the first People’s Rally. Organizer Norio Hayakawa, a funeral director from Gardena, Calif., called it a historic event that will grow. His aim for the rally was to bring attention to the plight of 39 former workers who were denied in 1996 the right to sue the Air Force facility for harm they say they suffered from exposure to toxic chemicals. 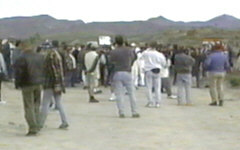 Hayakawa speaks to protesters. Ralph Fountain photo. He also proposed — and figured he was being listened to and recorded through the various devices propped on the hillsides — that the government create a fence around the base and a guard station at the fence. While he tiptoed on the issue of the purpose of the research, he also cautioned that research at the base could be used against the American public. There was also James Whisler, 30, a heavy-equipment mechanic from Battle Mountain, who is simply a devout Christian convinced that the billions of tax dollars spent at the base are not for the protection of America but for its enslavement. He wants to save as many souls as possible before that happens. Sitting Friday night in the Little A’Le’Inn Cafe on state Route 375 in Rachel — in the background Hayakawa plays country western music on his electric organ — Whisler exhausts himself and overwhelms listeners with a barrage of fact and belief that encompasses everything from the design of the nation’s capital to John Lennon’s song “Imagine” as proof that a one-world Luciferian government is the goal of elitist Americans. In a nutshell, Whisler believes that elitists known as the Illuminati control the United States through the Federal Reserve, and with their fingers on the nation’s purse strings, they are using tax dollars to design UFOs to terrorize the world for the distinct purpose of unifying it. “Create a common enemy to unite people of the world,” he said. Once it’s unified, the goal is to create a fascist rule, much like Germany under Adolf Hitler, he said. Whisler wasn’t hateful in his delivery, just impassioned. Syndicated radio talk show host Anthony Hilder showed more revulsion. Wearing a magenta shirt and pants, he made a big impression in voicing his open distaste for the government under President Clinton. Another talk show host, Victor Camacho, arrived from Los Angeles with a bus load of listeners to his 1 to 5 a.m. radio program, “A Little of Everything.” The group drove nine hours, stopping 30 minutes in Las Vegas, and got to the rally site at 2:15 a.m.
Mauricio Ramirez said he’s been interested in the UFOs since he saw one as a boy in Tampico, Mexico, 20 years ago. He and the others planned to stay overnight Saturday and hike with Hayakawa today to a summit to view the base, which will be more than 20 miles away. Michael Schratt, 29, a draftsman from San Diego, was versed on the high-tech aircraft believed under construction at the facility. He produced scale models of what he said were Air Force flying saucers and other craft built upon information gleaned from public documents. His ultimate interest is less apocalyptic than it is curiosity. He wants to get into the base to see for himself what he’s only been allowed to imagine. 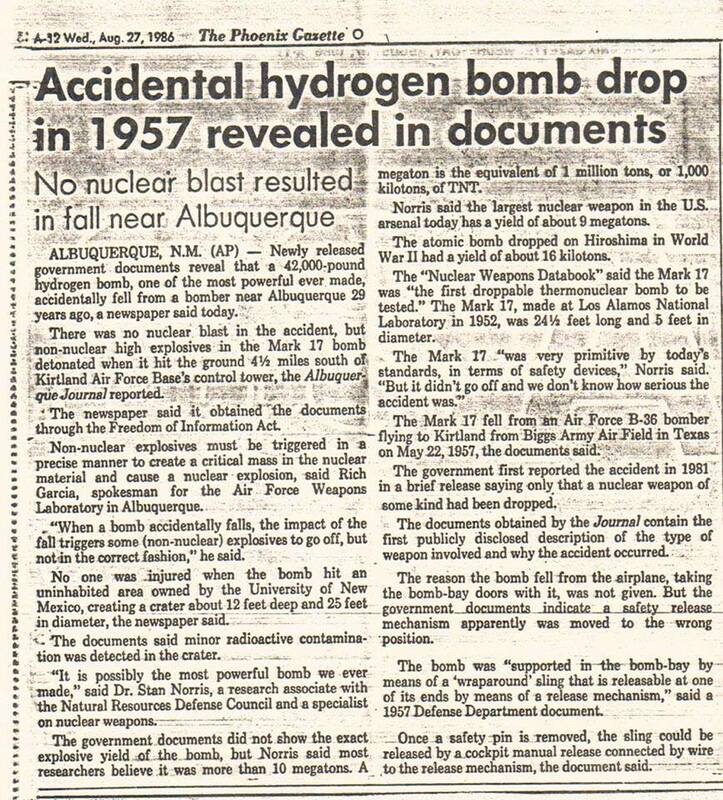 Those of us living in the region had long known, and, indeed, were strangely proud of the fact, that Albuquerque was likely to be a major enemy military target due to the region’s role in the production, testing and storage of atomic and hydrogen weaponry. 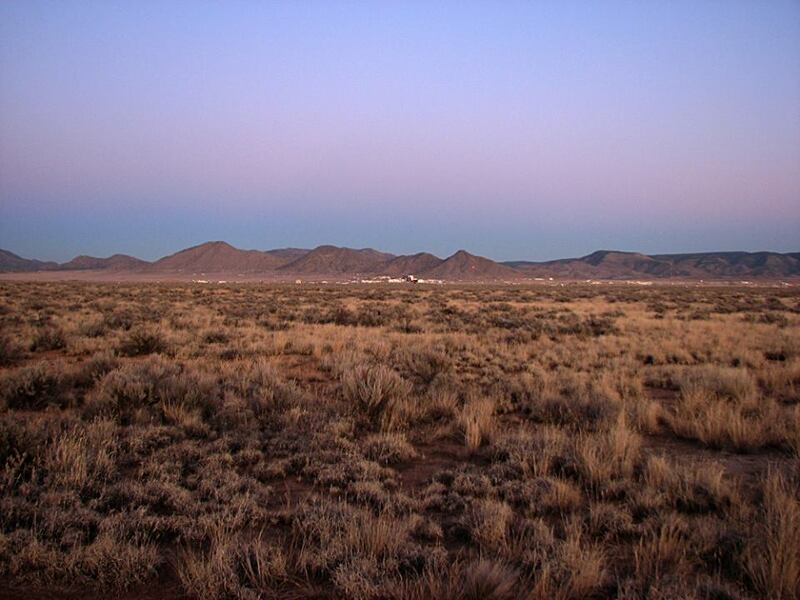 Nearby Sandia Base, nestled in the foothills of the Manzano Mountains, was widely suspected of housing extensive underground storage facilities where much of the nation’s nuclear arsenal was guarded. 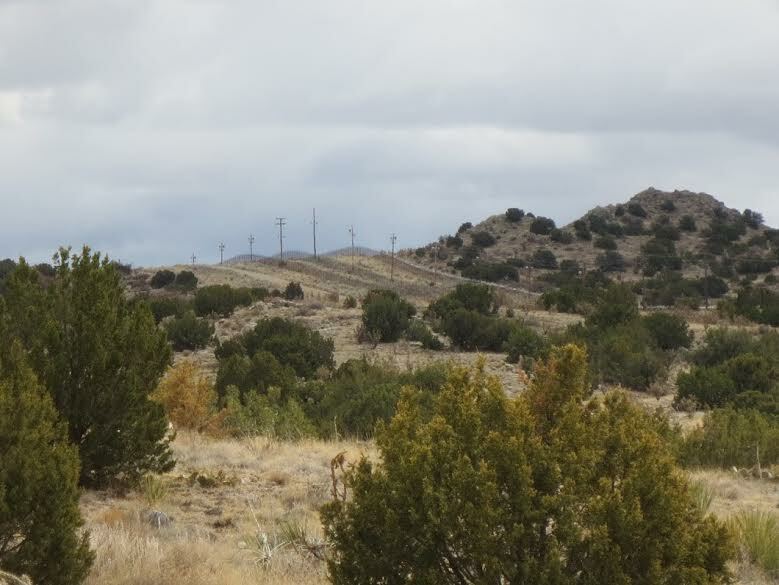 Electrified, barbed-wire double fences, patrolled by guard dogs, were clearly visible from the highway as one entered or left Albuquerque through Tijeras Canyon to the east. Sixty miles to the northwest, the heavily guarded Atomic City of Los Alamos, creation site of the first atomic bombs and then, as now, a major national arms production laboratory, guaranteed our supremacy as a prime Soviet target. On that particular day in May 1957, unknown to any of us, a huge B-36 bomber with a crew of 13 was preparing to land at Kirtland Air Force base. On board, as recounted in John May’s “The Greenpeace Book of the Nuclear Age” and later interviews with surviving crewmen, was the Gold War’s ultimate product. 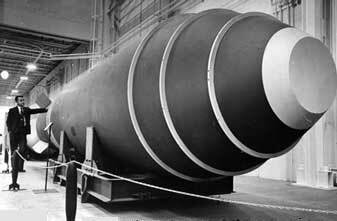 It was a 42,000-pound, 10-megaton hydrogen bomb – the largest weapon ever made in the world up to that time, and the first droppable thermonuclear device – traveling incognito under the code name of Mark 17. The giant bomber, a mainstay of America’s Strategic Air Command forces, was commanded by veteran pilot Air Force Lt. Col. Richard Meyer with the mission of ferrying its deadly payload from Biggs Air Force Base in Texas to Albuquerque’s Kirtland field. With the plane descending to 1,700 feet and making its final approach before landing at Kirtland, Carp began moving back toward the bomb. As described years later by another crewman, the difficult job resulted in Carp hanging over the 25 foot long, steel-encased weapon, roughly the size and shape of a large whale, “literally by his toes” to retrieve the pin. It was 11:49 a.m. In a recent interview, however, Carp, now a businessman in San Francisco, has challenged the turbulence-fall scenario. He asserts — as the one eyewitness to the entire event — that a “defectively designed” manual release mechanism had been accidentally pulled into release mode by a snag in his long cable, causing the bomb to drop the instant he pulled the pin. For most of the intervening years the American public knew nothing of what had happened, and, officially, of course, the event didn’t happen at all. If exposure of these events is the first step in understanding them, then a subsequent stage should be a frank admission by all of us that we knew and even tacitly approved of the conditions that brought about those near-misses and what we might more appropriately call “poisoned arrows,” the above-ground nuclear tests, the uranium mines and nuclear plants whose careless use contaminated our soil, ionized our atmosphere, poisoned our animals and even irradiated our own bodies. And if we did not know of them, like the “good Germans” who did not know of the concentration camps, then why not? What ferocious system of denial allowed us not to know, allowed us to shield ourselves from what should have been evident? Who is there to blame in a democratic society, finally, but ourselves? 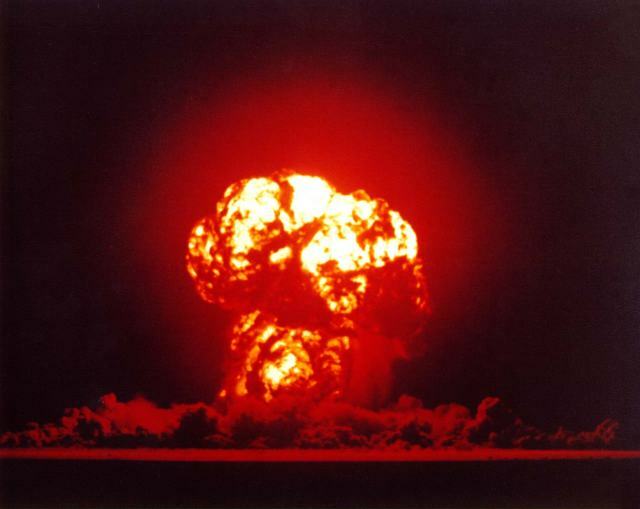 Only the bomb’s conventional explosives – those necessary but not sufficient to start the nuclear chain reaction – were triggered by the fall, and, according to the experts, no radioactivity was detected beyond the lip of the crater. Traces of the luckless cow, reportedly, were scattered over a much wider area. Extending 25 feet from nose to tail, standing more than five feet in diameter at its core and with a total weight of 41,400 pounds, this was evidently nature’s ultimate experiment in size. At what scale does any creature exceed its own ecological niche? If there is a lesson to be learned here and in the discovery of other events that “didn’t happen” simply because we did not know of them until now, it is not whom to blame, but rather the many ways in which blind fear, magnified by secrecy, can turn all of us into our own worst enemies. Can’t get any better than this….a great, bed-time Science Fiction story…..READ ON….and sweet dreams!! A local dentist was later presented to reporters who claimed he had treated Eisenhower. Significantly, there are no records at the Eisenhower Library — which reportedly has extensive records related to Eisenhower’s health — that he ever underwent dental surgery in February 1954, according to UFO researcher William Moore. Eisenhower thus became the first American president to have direct contact with extraterrestrials, according to conspiracy theorists. The meeting took place at Edwards Air Force Base in southern California during the early hours of February 21 in 1954. It was the first in a series of meetings that culminated in the signing of a treaty between the U.S. government and an extraterrestrial race called the Greys. The First Contact meeting, as it is termed in UFO conspiracy theory circles, involved some intrigue. 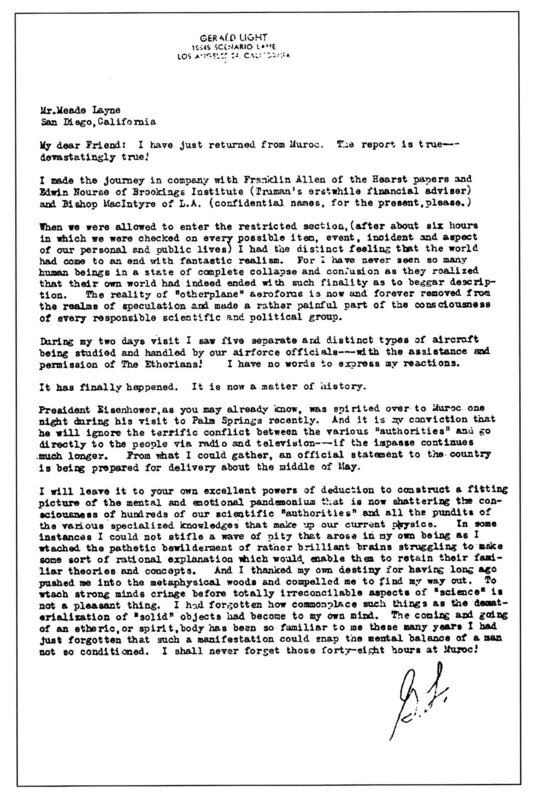 Eisenhower’s secret First Contact meeting on February 21, 1954, is believed to have been with the Nordic aliens, also known as Pleiadian aliens, an advanced extraterrestrial race from the Pleiades star cluster with distinctive Nordic appearance, such as fair hair, blue eyes, and white skin. The two sides were unable to reach an agreement on the night of the First Contact, and the Greys took advantage of the failure by offering more favorable terms. The offer by the Greys allegedly led to the first treaty between humans and an extraterrestrial race. According to UFO conspiracy theorists, several pieces of circumstantial evidence add up to support claims that the Eisenhower administration held “First Contact” meetings with extraterrestrial beings. The first circumstantial evidence was the awkward manner in which Eisenhower “disappeared” during the night of February 20-21 in the midst of an unscheduled winter vacation in Palm Springs, California, and the clumsy efforts by officials to explain his disappearance. The group of “community leaders” included Edwin Nourse, President’s Truman’s chief economic adviser, Cardinal James Francis MacIntyre, head of the Catholic Church in Los Angeles at the time, and 80-year-old Franklin Winthrop Allen, a former reporter with Hearst Newspaper Group. The aircraft are believed to be alien UFOs stored at the facility for reverse-engineering studies. The letter gives a vivid description of the bewilderment, confusion, and panic among the officials present at the meeting. UFO conspiracy theorists claim that Light’s account reveals uncertainty about how to respond to the aliens and fears due to the Cold War that the aliens could turn to the Soviets if the Americans spurned them. But it is claimed that Eisenhower finally decided to reject the proposals of the Nordic aliens he met at the First Contact meeting at the Edwards Air Force Base in February 1954, and his administration eventually signed a treaty with the Greys, who offered to transfer their technology exclusively to the United States. Several whistle-blowers claimed to have seen documents signed at the meetings while others claimed they obtained information from inside sources. The different versions of what allegedly transpired at the First Contact meetings leaked by the whistle-blowers agree on certain major points but differ in specific details. One of the best-known whistle-blowers, William Cooper, a former Naval intelligence officer who allegedly had access to classified documents, claimed that the First Contact meeting at the Edward Air Force Base in February 1954 was the culmination of a series of events after astronomers discovered a fleet of huge UFOs approaching Earth in 1953. First mistaken for asteroids, they were later determined to be spaceships. Alien radio signals were allegedly intercepted under Project Sigma just before the UFOs went into high orbit. Project Plato was launched to receive the aliens and hold talks. But before the aliens approaching in a huge UFO fleet landed, a different alien race contacted the U.S government and warned against the first group of aliens. But talks with the first group failed after they demanded nuclear disarmament and warned that humanity was on a path to self-destruction. They proposed instead to help humans to develop along a peaceful path to spiritual fulfillment. Because the primary interest of the U.S. government at the time was signing a treaty that gives access to advanced alien technology, the Eisenhower administration rejected the overtures from the first alien group — the Nordic aliens — during the First Contact meeting at the Edwards Air Base and agreed to sign a treaty with the second group — the Greys — during a subsequent meeting at the Holloman Air Force Base in New Mexico in 1954. Elements of the sketchy account given by Cooper were allegedly confirmed independently by other whistle-blowers, including Charles Suggs, a former retired U.S. Marine Corps Sergeant, who claimed that his father, a senior naval officer, had attended the First Contact meeting with the Nordic aliens in February 1954. John Lear, another independent whistle-blower, was a former air force pilot and the son of William Lear, who built the Lear Jet. Lear also confirmed that two alien races had been involved in the First Contact meetings. Robert Dean, a former intelligence officer, described Nordic aliens as humanoids with Nordic features, and the Greys as tall humanoids up to 9 feet tall with pale white skin, large eyes, large head, and spindly limbs. Greys allegedly originated from a star in the constellation of Orion. Other reports claimed they came from a planet in the star system Zeta Reticuli. Details of the agreement with the Greys leaked by whistle-blowers include non-interference in human affairs in exchange for accommodation on Earth under conditions of secrecy. In return, they would furnish the U.S. government with advanced technology to help the country to stay ahead of enemy nations. The Greys also agreed they would not approach any other nation to make a treaty. The Greys were housed in an underground facility in Dulce (in New Mexico) where Phil Schneider claimed he encountered them while working as a geological engineer employed by a private company contracted to build underground bases for the Greys. Schneider revealed that part of the treaty agreement allowed the Greys to abduct a very limited number of humans for medical research and experiments. But the Greys proved untrustworthy and violated the agreement on abductions. 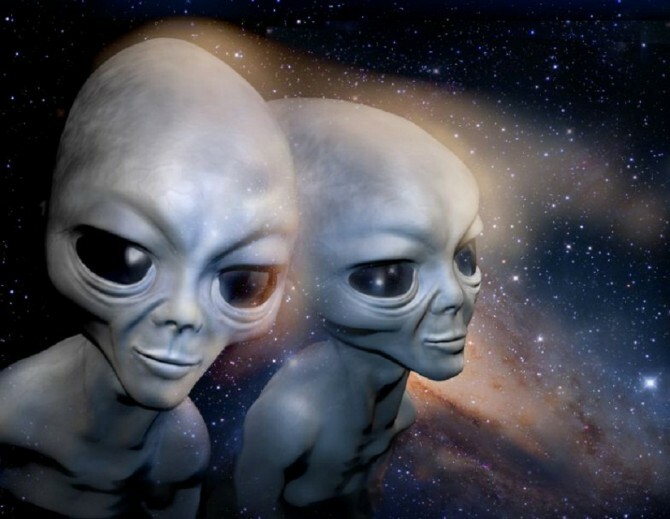 Most reports of UFO sightings and stories of abductions involved Greys freely violating the treaty with the government, according to UFO conspiracy theorists. The Westall UFO encounter is an event that occurred on 6 April 1966 in Melbourne, Victoria, Australia. Around 11:00 am, for about 20 minutes, more than 200 students and teachers at two Victorian state schools witnessed some unexplained flying object(s) which they said descended into a nearby open field. The paddock was adjacent to a grove of pine trees in an area known as The Grange (now a nature reserve). According to reports, the object(s) then ascended quickly in a north-westerly direction over the suburb of Clayton South, Victoria, Australia. 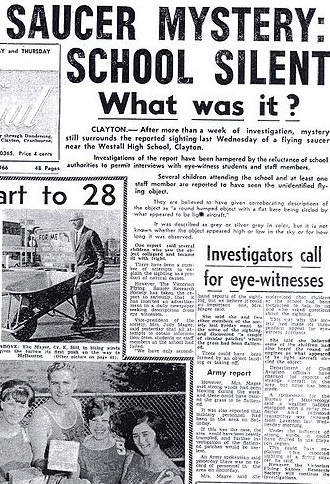 At approximately 11:00 am on Wednesday, 6 April 1966, a class of students and a teacher from Westall High School (now Westall Secondary College) were outside on the main oval when an object, described as being a grey saucer shaped craft with a slight purple hue and being about twice the size of a family car, but very round, was seen. Andrew Greenwood, a science teacher at the high school, told The Dandenong Journal at the time that he saw a silvery-green disc. There were reports from some witnesses that the largest craft flew over and along some large Electricity Pylons near the school before landing. It was further reported that there were two other smaller craft of similar design that had hovered over ( but not landed on and only hovered above ) the dirt roadway at the front of the school. Further reports suggest that the larger main craft that landed in the paddock may have had some sort of problems and that the two smaller craft were there to assist it. According to witnesses the objects were descending and then crossed and overflew the high school’s south-west corner, going in a south-easterly direction, before disappearing from sight as it descended behind a stand of trees and into a paddock at The Grange in front of the Westall State School (primary students). The main and biggest object had landed on the ground. After a short period (approximately 20 minutes) the object – with witnesses now numbering over 210 – then rose and climbed at speed and departed towards the north-west. None of the witnesses said that they saw any aliens or any people in or around any of the craft. It was suggested that if there were in fact any (people) they would not have been able to stand up as the height of the craft was no higher than an average family car, the craft being round and large at the base but lacking in height. Like the saucer of an upside down tea cup. The first was on 14 April. and the next was on 21 April. A number of small aeroplanes circled around it. However, a check later showed that no commercial, private or RAAF ( royal australian air force ) pilots had reported anything unusual in the area. GTV Channel 9 television also ran a news report about the encounter. A student, Joy Tighe, described the event for the reporter. However, a copy of this tape is not available. Channel 9 reports that it was removed from their archive and not returned. One of the students, a girl, ran towards the craft that had landed and reached it before the other students had arrived. She was found in a collapsed and dazed state. An ambulance was called and she was taken away to hospital. This girl was one of the leading athletes in the school and could outrun almost all the others, being very fit. Apart from that no one else was hurt in the incident. Some of the students had rung up the local newspapers and TV stations and they had sent reporters to the school. These media groups had rung the police and in turn the police had rung the local RAAF military base. Soon all were involved in the incident. A full school assembly was held that afternoon at Westall High School. The headmaster, with about three men in dark suits beside him, who no one from the school had seen before, made an announcement that “nothing had happened”. The students and staff were told to “keep your mouths shut”. The Headmaster further told the staff and students that “there are no such things as flying saucers” ( actual quote ). Andrew Greenwood, the science teacher whose picture appeared in the local newspaper with the story was visited a few days later at home by two people who announced themselves as from the RAAF. (The Royal Australian Air Force). They told him if he made any more public statements they would “leak out” that he had a “drinking problem” and that would mean the end of his career as a teacher. The student who was taken to hospital never returned to Westall High school. Her family moved out of the family home that night, never to return. When one of her very good friends called around to her house, which was very close to the school, a middle aged woman answered the door, someone she had not seen before, and told her “she does not live here” and that she “must have the wrong house”. Just after the incident two truckloads of military people arrived at the field where the craft landed, sealed off the area, and walked over it with what looked like metal detectors. Anyone who got too close were told to “leave immediately or else”. They took measurements of the circle and indentations made by the craft in the ground and when they finished they burnt the grass so no circle remained shown. Mr Ryan, 38, was alerted to the events in the 1980s by a housemate who was there. 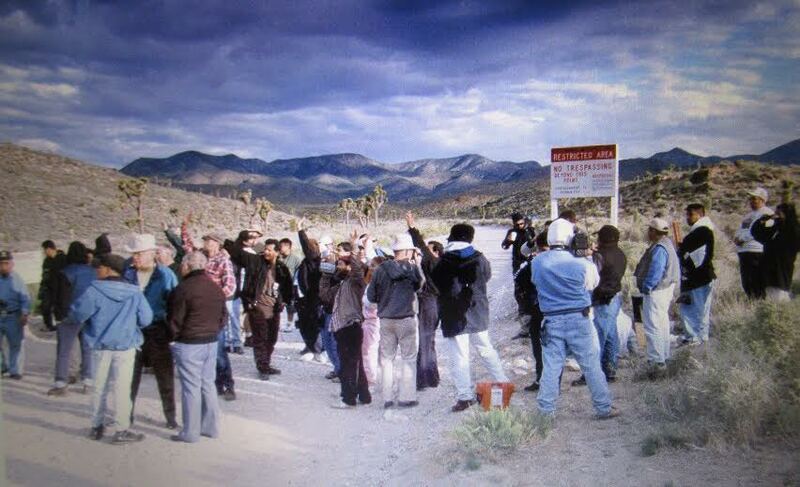 Unlike most UFO sightings, the Westall objects had a large number of credible witnesses. It was viewed in broad daylight by over 200 people and attracted a forceful response from police and the government who used all sorts of threats to cover this up. People were told everything from “you did not see anything” to “we will cripple you if you say anything” and now in 2011 the officials are saying “nothing at all happened people – what are you on about”. AND most of the records of the event are now “lost” or were “never there”. On the UFO, everyone seems to agree, Mr Ryan says. It was a low-flying, silver/grey shining object, either of classical flying saucer shape or close to it, “a cup turned upside down on a saucer”. The students were familiar with light aircraft because the schools were close to Moorabbin Airport. Although the UFO was of similar size, “everyone said straight away that they knew it was not a plane”, Mr Ryan said, nor a weather balloon. The object was in view for up to 20 minutes, and many saw it descend. The Dandenong Journal, for which the story was front-page news two weeks in a row, reported that “students and staff have been instructed to ‘talk to no-one’ about the incident”. Nevertheless, one teacher, Andrew Greenwood, gave the paper a detailed account. One of the closest witnesses was a boy whose family leased land at Grange Reserve for horses. Shaun Matthews (not a student at Westall) was on holidays and spending time on the land. He said police and other officials interviewed his mother. The Victorian UFO Research Society investigated the incident. VUFORS secretary Tony Cook said Westall remained one of Australia’s major unexplained UFO cases. The top one was the case of Frederick Valentich, a 20-year-old Melbourne pilot whose light plane disappeared while flying over Bass Strait in 1978. As well, “if there was a whole lot of officials investigating it, there must be an official report in RAAF archives somewhere”. But Mr Ryan said that no one at the RAAF knew of the incident. But given the history of the case — the way students and staff were told to keep quiet from the start — that was not surprising, he said. WESTALL ‘UFO’ INCIDENT WAS ACTUALLY GOVERNMENT RADIATION TESTING, REPORTS REVEAL……OR, WAS IT? “An almost 50-year-old mystery when more than 200 people believed they had a close encounter with a UFO landing in Clayton may have finally been solved after newly-unearthed government documents revealed a secret radiation-testing program. Although federal and state government agencies refused to comment about the 1966 ‘Westall’ incident at the time, it is now believed that, rather than a UFO, what landed was an errant high altitude balloon used to monitor radiation levels after the controversial Maralinga nuclear tests. 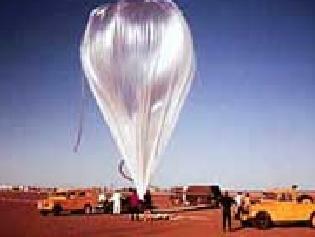 The HIBAL program was a joint US-Australian initiative to monitor atmospheric radiation levels using large silver balloons equipped with sensors between 1960 and 1969. Documents held by the National Archives and former Department of Supply indicate one test balloon launched from Mildura may have been blown off course and came down in Clayton South in a paddock near Westall High School, alarming and baffling hundreds of eyewitnesses, including teachers and students.